How fast can a paramotor fly? When they need to fly slow enough to allow for foot launching and landing, you'd think they'd be pretty slow; after all, the average person can only run at 10 mph! So are they really that slow? Asking how fast a paramotor is, is like asking how fast a car is, because they're all different. There's also many different factors that will affect how fast a paramotor flies. For example, you could be flying along at 35 mph heading north, but when you turn to the south your speed may drop to 5 mph. 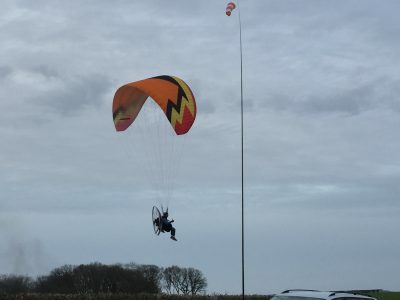 As a beginner, this probably makes no sense to you whatsoever, so in this post we'll look at everything that will affect paramotor speed. From wind speed, weight, the wing, the paramotor, and even the pilot! What's the average paramotor speed? Before we look at the variables, you'll be glad to know that the average paramotor speed is 30 mph. This is in good conditions with no wind, meaning they're much faster than the average human running speed. 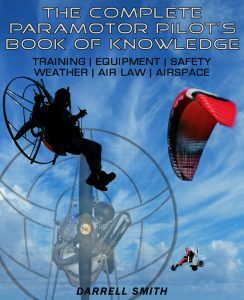 But what makes paramotor speed vary so much? Let's find out. How does the wind affect paramotor speed? The thing that will affect paramotor speed the most is the wind. When we launch or land our paramotors, we always takeoff and land into the wind. One reason for this is because even the slightest breeze is enough to slow a paramotor down. A 25 mph headwind is enough to slow most paramotors to a stop, meaning there's no forward motion, or zero ground speed. But even with no ground speed, the paramotor will remain airborne because the air is still rushing past the wing creating the lift needed to keep it in flight. 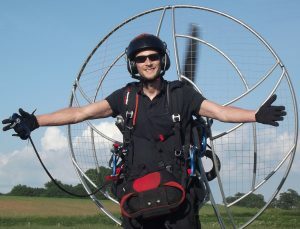 Wind gradient, which is the gradual rise in wind speed as altitude increases, will often cause paramotor pilots to come to a complete stop, or even to fly backwards at high altitudes. Wind speeds should always be taken into account before taking to the air. You'll need to check the average wind speed, wind gusts, winds aloft speeds, and the direction of the wind, and then plan your flight around it. There's some good tips for this in my cross country post. The wind can also be used to make you fly faster. A strong tailwind, meaning the wind is blowing from behind, can propel a paramotor to over 60 mph. If you plan a flight correctly, the wind is a great tool to help you reach your destination much faster. Does the paramotor's wing affect its speed? As previously mentioned, all wings are different, and they will all have a different top speed. If you go to your favourite wing manufacturers website, you will see that each wing has a top speed listed in its specifications. It's unclear exactly how manufacturers test top speeds, as they will have to take all of the variables listed in this article into consideration, but it's a good way of comparing wings to find the fastest. The fastest wings will have a much higher aspect ratio, meaning they focus on speed and manoeuvrability. These wings are aimed at advanced pilots, and they require a much more active piloting technique to fly safely and efficiently. Beginner EN-A/B wings will have a lower aspect ratio. These wings will usually be much slower, more stable, and less prone to violent reactions during turbulence. We learned about the differences between reflex and classic wings in my wing guide here. Reflex wings will allow you to fly much faster, while at the same time increasing the collapse resistance of the wing. By releasing the trimmers and entering reflex mode, you can add as much as 8 mph to the speed of the paramotor. You can learn all about the speed bar and how to use it HERE. Will more weight make a paramotor slower? If you've ever seen a tandem paramotor in flight, then you probably noticed how slow it was. The weight of two people, a big powerful engine, and the extra harness and bars make the takeoff weight incredibly high. But this extra weight doesn't slow the paramotor down in the slightest. In fact, more weight actually means more speed! Although there may be slightly more drag, it's the tandem wing that makes the paramotor so slow. But what about single seat machines? The same applies! A 150 lb pilot will fly much slower than a 200 lb pilot flying the exact same setup. If it's speed you're after, it's better to buy a wing size that puts you at the heavier end of its weight range. 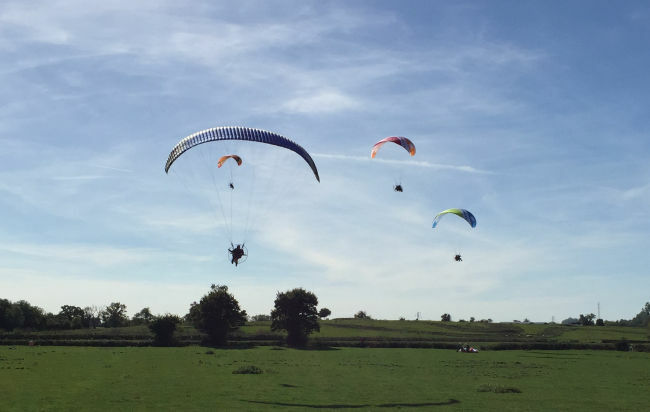 Due to varying weights, your choice of paramotor will also affect your top speed. For example, the super lightweight Air conception will weigh 10 KG less than the Parajet V3 that I'm currently flying. 10 KG will make a considerable difference to the speed you fly at. This is why wheeled paramotors tend to fly at much higher speeds; but remember, more weight also means that more power is needed to keep you aloft. This means that heavier machines will also burn more fuel. Heavier pilots fly faster, and this is something I notice a lot when flying with others. Weighing 150 lbs, I usually get left behind when flying cross country flights with other pilots. I regularly fly with a 200 lb pilot flying a beginner wing, and he flies much faster than me on my sport wing! Do powerful paramotors fly faster? Although the wing and its loading determines the speed you fly at, the paramotor has a very small part to play with top speed. When choosing a paramotor engine, it's important that it has enough power to be able to climb while trimmed out. If you're flying an under-powered paramotor that doesn't put out enough thrust to keep you flying level while at full trim, then your speed will be lower. This is because you won't be able to open the trimmers. Airspeed will also increase slightly when you're climbing, and decrease slightly when you're descending. So the fastest speeds will be reached when the wing is trimmed out, while climbing under power. Paramotor speed is limited by the amount of drag that is produced, mainly by the wing. When you see a paramotor pilot flying at full power, you'll notice the wing holding back. The paramotor swings out in front of the wing, but is held back by the drag the wing is producing. When you trim out and enter full reflex mode, you reduce lift and drag. This allows you to increase the power and fly faster. But the wing soon reaches a point where it's once again producing excess lift and drag, thus reaching its top speed. 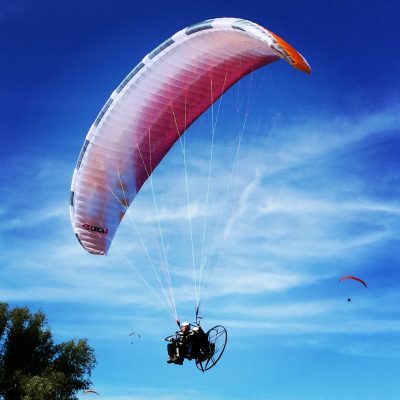 A paramotor wing has a very limited trim range, so the speed is always limited by excess lift and drag. But even if you could find a way to increase the trim range, you would eventually be limited by the amount of power needed to increase speed. Something else that limits the top speed of a paramotor is ultralight regulations. For a paramotor to be classed as an ultralight, it must have a top speed of no more than 55 knots, or 63.29 mph, at full power in level flight. Although no paramotor can currently fly this fast without the help of strong winds, future technology will be limited to this top speed. So with all of this in mind you can see how paramotor speeds vary, and what you can do to increase them. Paramotors will never be super fast, but when you're dragging your feet along the ground, or skimming hedgerows, 30 mph is more than enough! Now you know how fast a paramotor can fly, find out how far you can fly HERE.